Nancy Zieman is the Julia Child of sewing – her public television program, Sewing with Nancy, has been on the air for 30 years. This book was published in the early 90s. 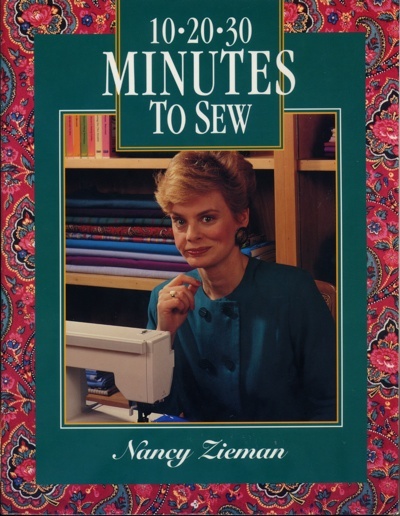 Typical for a Nancy Zieman book, it is technique-oriented and is jammed full of sewing hints and tips, together with clear line-drawn technical illustrations and photographs of the finished results. The theme in 10, 20, 30 Minutes to Sew is to help you use your sewing time more effectively in two ways: 1) improve the way you organize your projects and 2) streamline some common sewing techniques. Nancy leads you through the process of planning sewing projects and breaking them down into “units of work” that can each be completed in 10, 20, or 30 minutes. She also shows you how to do as much work as possible in advance, and how to juggle multiple projects at once. Then, when you have some time free in your schedule, you can pick the unit of work from an open project that best fits the time available and your mood. The remainder of the book is a collection of sewing techniques, often with streamlined shortcuts. The techniques are grouped by chapter: fashion design elements, serger techniques, knit fabrics, elastics, and specialty feet for your sewing machine. The knits and elastics chapters get special mention for their breadth of content. Knits has a catalog of instructions for many types of knit collars, and Elastics offers many variations for waistbands and legbands using different types of elastic. It even shows you how to make cycling shorts. If I have one difficulty with the book, is that it doesn’t completely stay on-theme. Many techniques are labeled with the amount of time they will take to execute – 10, 20, or 30 minutes. But a lot of them aren’t. And a few of the techniques are simply specialized embellishments – decorating the front of a garment with twists of fabric created on a serger – for example. Finally, there’s an appendix in the back with a basic getting-started guide for those completely new to sewing. There’s also a glossary of sewing terms, including photos and diagrams along with the definitions for most terms. I picked this book up from Alibris for 99 cents. I think I might have read about it online somewhere. This entry was posted in Books, Reviews and tagged Nancy Zieman on March 10, 2013 by mportuesisf.